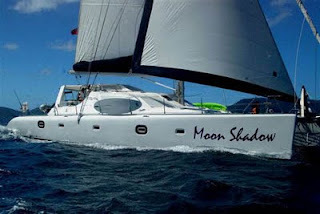 Just like Wild Thing II, the Voyage Yacht Catamaran, Moon Shadow is 58ft and is fully equipped for up to 8 guests. With Four elegantly-adorned large staterooms, each with its own: 17-inch digital television with built-in DVD and CD player, en suite separate shower, sink, vanity unit and dressing mirror, electric fresh water head, 110V power outlet and hair dryer. Air conditioning and cabin fans throughout. Sit comfortably while enjoying the panoramic views from the large saloon and bar. A gourment kitchen and galley with serving counter. Spacious salon with 32" TV with surround sound DVD player. Choose your favorite tunes from our extensive CD/DVD library and enjoy listening to them anywhere onboard with our Bose surround sound system. A Large shaded and protected cockpit and helm station. Relax under the sun or at night watch for shooting stars on the large forward trampoline. The large drop down bow stairway allows for easy access to the beaches and snorkeling. Up to 15% off 2009 inquiries. Kids go free, (restrictions apply). 10 nights for the price 7. (Not applicable for Christmas and New Years). Summer / Winter Ports: Tortola, BVI.